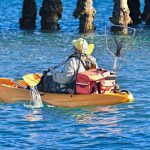 As kayak fishing takes off, more innovations are modernising and modifying the application. 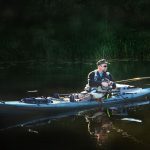 The latest revamp in the kayak world has been the introduction of pedal kayaks, with many of the major brands now offering pedal versions of their favourite kayaks. However, as with any fishing innovation, the new technology brings with it a new set of challenges and drawbacks. So where should you invest your hard-earned cash, in a pedal kayak or a traditional paddle version? The hands-free aspect of pedal kayaks makes them far easier to use than their paddle counterparts. 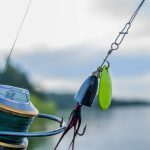 You can keep your rod firmly in your grip while you maneuver and adjust your kayak, offering more control and better position when fighting a fish. However, that doesn’t necessarily mean pedal kayaks are optimal for yak fishing. Part of the issue is that you are relying on a pedal mechanism to carry you home. Should that fail, you are quite literally up the proverbial creek without a paddle. As a result, most pedal kayak fishos will carry a small paddle with them in case of emergency. Which begs the question, if we have to bring a paddle along anyway, why not just go for a regular paddle kayak? Not only are you sacrificing space by carrying an additional paddle, the pedal mechanism itself is far larger than storing a paddle. You will undoubtedly sacrifice cargo space if you opt for a pedal yak. If you are the type of angler who has no qualms about kayaking lost distance to find the perfect goldmine of fish, a pedal yak might be for you. The pedal versions are more efficient when travelling long distances and should save you time and energy. It is possible to get the same speed out of your paddle kayak but your technique needs to be good. This can make pedal kayaks easier for beginners yak fishos whose paddle technique might be slower and more inefficient. 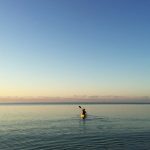 Although paddle kayaks provide swift, hands-free movement, for small adjustments, paddle power has to get the nod. A small wrist movement can give you the tiny position adjustment you need. If the wind is pushing you against the bank or into some structure, a quick jab of the paddle will get you out of it. With a pedal kayak, it can be trickier. Regarding ease of transportation, the paddle kayaks are a little lighter. They don’t have to house pedals, which means less plastic and steel, less weight and an easier yak to transport. My paddle kayak is almost as light as a surfboard. I’m not a particularly large bloke and like the luxury of being able to run down the beach with my kayak and get going as quickly as possible. Probably the biggest factor that will influence a prospective kayak buyer is the price. In this arena, the paddle kayak is king. The pedal versions still cost significantly more than their paddle-propelled counterparts. This could change in the future as manufacturing costs decrease but for now, paddle kayaks are the only way to go if you are on a budget. While there are subtle differences between the two, as mentioned above, what really influences which kayak I take out on the water, are the conditions. If it is windy, or you frequently fish in windy conditions, I would always opt for a pedal yak. If I am in a paddle yak, the wind takes me here there and everywhere and casting becomes a nightmare. The pedal option gives me a bit more stability to get my cast off unimpeded. Similarly, if I am fishing shallow conditions and a tight waterway, I would definitely use my paddle yak. The paddle itself is a valuable tool in adjusting my position and I might have to remove the pedal drive on a pedal yak if the water is too shallow. If I am heading a little further afield to try out a new fishing area, I will usually take my pedal kayak because I know it will get me there quicker and I won’t die from exhaustion on the way. 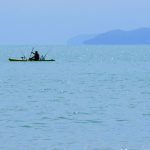 These are the pros and cons of each kayak but it fundamentally comes down to your fishing style, conditions and budget. 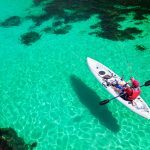 You need a kayak that suits you and your local fishing environment, that could be a paddle yak or a pedal yak. To be honest, I love nothing more than a stealthy electric kayak motor that is a very simple and low-cost addon. Do you have any advice for choosing between a paddle or pedal kayak? Let us know in the comments section below.